Glasgow Women’s Library has always grown with the support of volunteers – if you are interested in volunteering with the Library, take a look at our volunteering opportunities. It costs £5 each day to support each learner to access all that we have to offer and we have no funding for core costs. We rely on our Friends and supporters to ensure we can continue to offer and deliver our services to all. Make a donation online now, and help us to continue our important work. Become a Friend from just £5 a month and help the Library to provide its services to as many women as possible, and ensure the Library can continue to preserve and promote the lives and experiences of Scotland’s women. Women on the Shelf (WoTS) is a major fundraising initiative, designed to raise essential funds for refurbishing and fitting out our future new premises. We want to make sure that as many people as possible feel an ownership of the new ‘Women’s Library of Scotland’ and so Women on the Shelf enables individuals and organisations to sponsor a Women’s Library section, shelf or book. Every sponsor will be acknowledged in the very fabric of the Women’s Library premises and every penny raised will go towards the refurbishment fund. 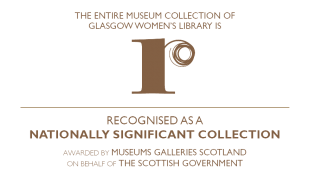 Leaving a Legacy is a gift that lasts beyond your lifetime and will help to ensure that Glasgow Women’s Library will continue to grow and thrive as one of Scotland’s national treasures. Find out more about leaving a legacy for GWL in your will here.